Angar's open kitchen is one of the first things that strikes me as I walk into the restaurant. It is not a big restaurant seating around 60 indoors, making for a very intimate dining space, notwithstanding that outdoor seating, when weather permits, will take capacity to around 100. There is nothing ostentatious about Angar. 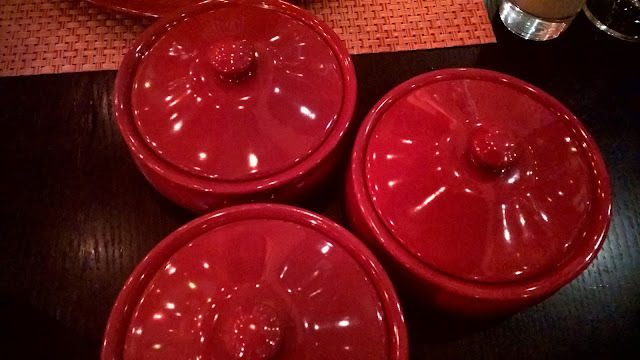 Red is a colour that brings drama to the restaurant. It is a avery dramatic red. Ornate lighting hang very pretty from the ceiling, but my eyes keep going back to the open kitchen. Tonight I am dining with my daughter as well as another guest, and after we are seated, she is given a kids kit to entertain her. An early nice touch. After I am offered a glass of NV Laurent Perrier Brut, Chef talks to me about the dishes and makes his recommendations. 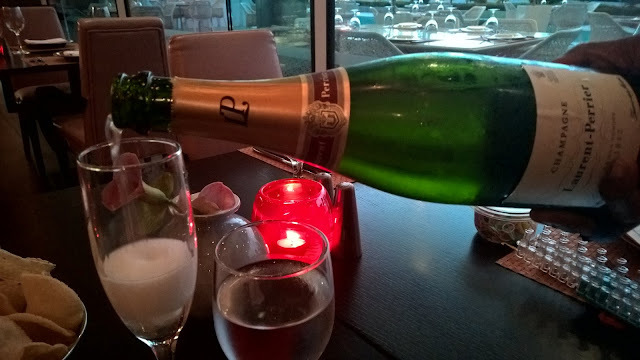 While Prosecco goes really well with Indian food, the Laurent Perrier is a very versatile champagne, and elevates the occasion to another level. At this point, the words of Marlene Dietrich resonate within me: "Champagne makes you feel like it's Sunday and better days are just around the corner." Papdums are served, with a choice of 4 sauces - as is customary in many quality Indian restaurants. Soon after, we are served appetisers of Onion Bjajia, crispy red onion fritters and Karare Phool Gobi, a crispy cauliflower and red chilli floret. They work effectively as an appetiser with just the perfect portion and able to make me want more. Both offer crispy elements, but decidedly different textures. The gobi, in particular, bowls me over with its sweet and spicy balance. With perfect timing between the appetisers and the starters, the latter are served. Quinoa gol goppa, Codai chicken, Duck galouti and Tandoori salmon are presented, again with sufficient attention paid to the size of the portions. 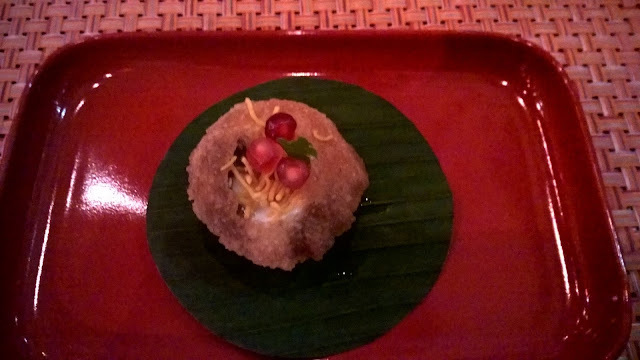 Those who love pani puri will enjoy the quinoa gol goppa, but rather than an untextured filling, this is rich in quinoa, and hence texture. The duck galouti, as the name suggests, melts on the tongue, to use an expression that indicates a tender piece of meat with a perfect texture. It finds itself on a bed of saffron bread with orange marmalade to bring a tangy sweet to bear on the duck. Next, I try the Codai chicken, a favourite dish with south Indians. Again, there is a sweet element to this dish, but the long taste is that of spices. Chef, I am pleased to say, has been generous with the spiciness in the dish. However, if I have to pick a winning starter, then I will look no further than the Tandoori salmon. It is a fine dish on so many levels. It could not have been cooked better, and breaks apart effortlessly as I poke at it. It excites me as much as cod usually excites me, so tender it is. The natural oil of the salmon is visible, glistening even in low light. Add to this the actual flavours of honey, mustard and dill, and you will appreciate my feeling about this dish. The mint puree around the dishes accentuates the gorgeous plating of this selection of starters. At my waiter's recommendation, I look at the wine list in anticipation of the main courses. 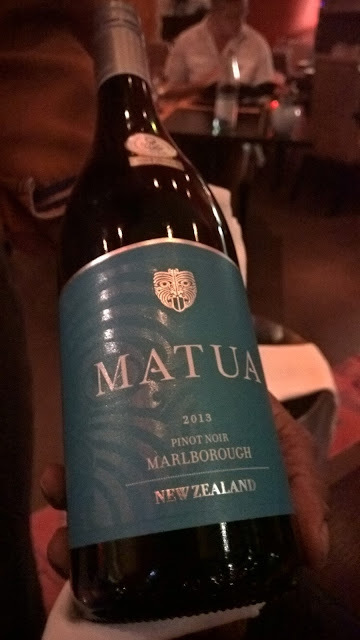 With a selection of around 13 or 14 by the glass options, I settle on the Matua Pinot Noir 2013. If the plates are dramatic owing to their colour, the serving dishes are on par. 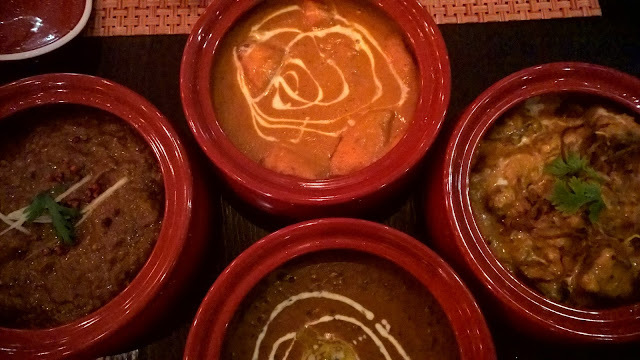 Butter chicken, Nariyali gucchi gosht, Dal makhani and Prawn chili milli are served as our main courses. The butter chicken checks all the boxes, but especially because the honey that is used to give it a hint of sweetness, is used sparingly, ensuring that the dish is not dominated by the honey. As for the the dal, it is spicy, smooth and creamy, having been slow cooked for just the right amount of time. Next, the prawn chili is my spiciest dish, but again balance prevails and the prawns are not overwhelmed by the spice. Finally, the stand out dish from the main selection is the lamb. Of course it has been well cooked, but it is the coconut sauce that surprises and wows. I have become accustomed to expecting my prawn curry to be coconut milk based. 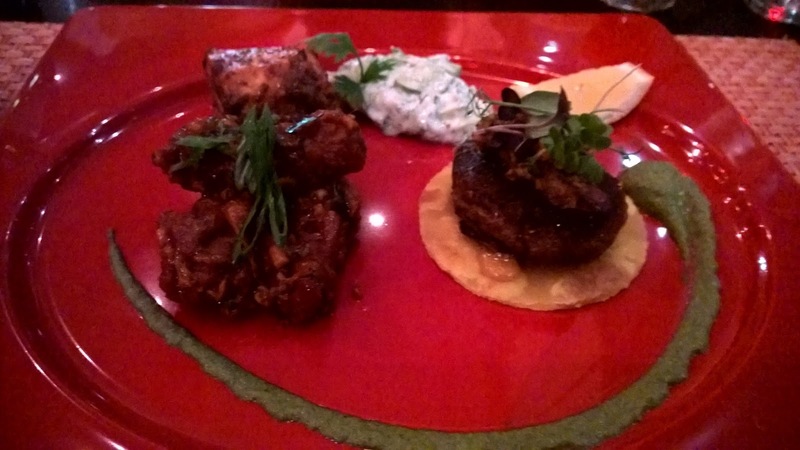 Chef Pradeep has cleverly played with guests' expectations and I love it! While I wait for dessert, I notice two tables of Indian guests. 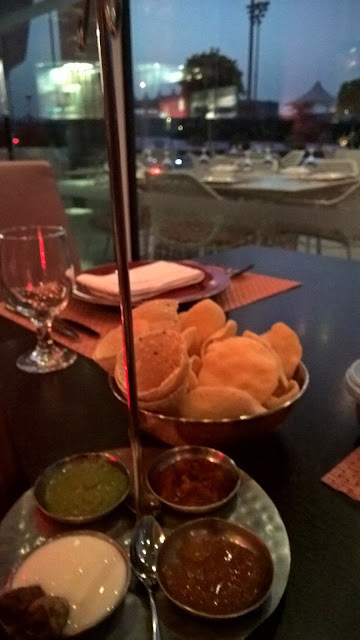 It occurs to me that I have not come across many high end Indian restaurants with Indian diners. This is obviously a credit to Chef that he and his team are creating dishes that pull the heart strings of these guests. The service is pitched at the right level. My waiter for the night, Rama, has the balance that I want in a waiter. Conversational but not overly familiar; attentive in his service without smothering me. Basically, there without being there if you know what I mean. 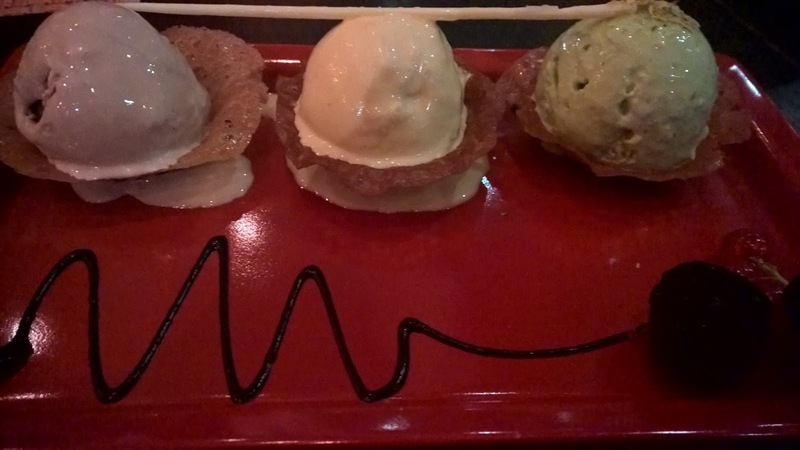 A sharing plate of a Medley of ice creams makes its way onto our table - thandi, mint and pistachio and Masala chai. It is the latter that I find irresistible. It evokes memories of Lipton chai shops where 1AED buys momentary happiness. Even my daughter, in her sleepy state, enjoys the taste. Of course we have to try the Gulab jamun, and while I know what to expect in terms of sweetness in these Indian dumplings, nothing prepares me for the delight that is the accompanying fig and ginger ice cream. It takes me back to South Africa where we had 'konfyt', a Dutch inspired jam created by boiling fruits in sugar. Furthermore, the crunch of the fig seeds is a wonderful surprise in an otherwise super smooth ice cream. I would have to say it is one of my two favourite ice creams I have enjoyed in my 4 years in the capital. 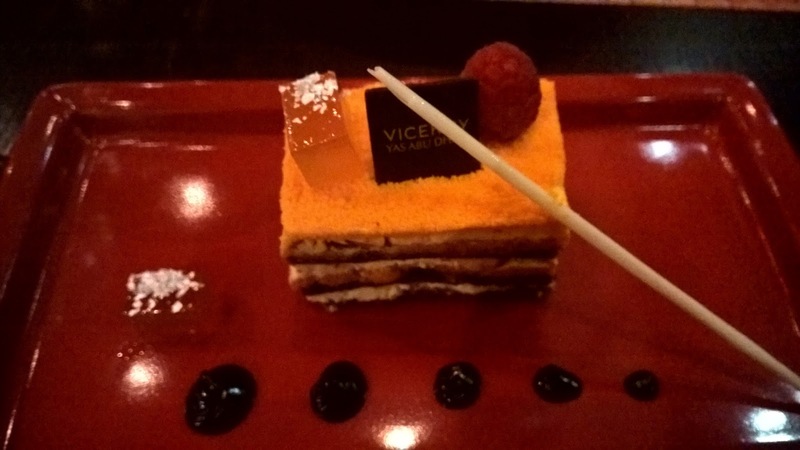 Finally, the Desi opera, is a tribute to Chef de Cuisine's passion for the opera cake; a dessert that inspired him to give it an Indian flavour, and it works. Yes, Chef Pradeep's eyes light up as he talks about the opera and his interpretation. Highly recommended. 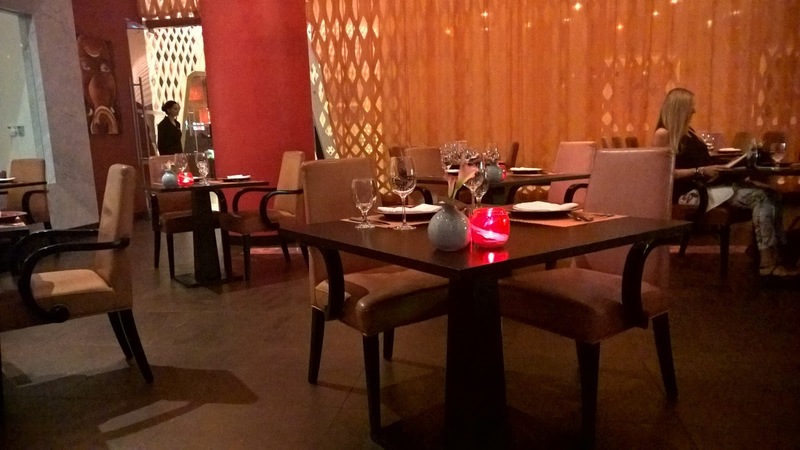 As is my custom as an evening ends and a warm bed beckons me, I reflected on what it is about Angar that makes it an immensely popular Indian restaurant, in a segment of the market that is incredibly competitive. As I thought about it, my attention went back to the open kitchen. Then it hit me. It is the food. No gimmicks here - just a chef who wants to create dishes of the highest quality, all characterised by the pursuit of balance. And I loved the result. Disclaimer: I consult at restaurants and hotels in an attempt to look at the entire product to take service levels to where they should be. I visited Angar as a guest of the restaurant.